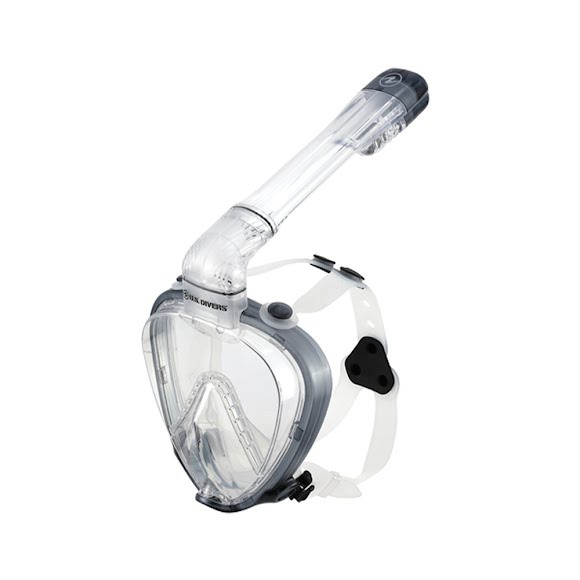 Breathe comfortably, naturally and safely underwater with US Divers' AirGo full face snorkeling mask. Designed with comfort, safety, and quality in mind, the AirGo is easy to adjust with a comfortable, ergonomic design made with hypoallergenic, soft silicone. It has a one-way purge valve to make it easy to clear, and since it has no mouthpiece, you don't have to deal with jaw fatigue. Breathe comfortably, naturally and safely underwater with US Divers&apos; AirGo full face snorkeling mask. Designed with comfort, safety, and quality in mind, the AirGo is easy to adjust with a comfortable, ergonomic design made with hypoallergenic, soft silicone. It has a one-way purge valve to make it easy to clear, and since it has no mouthpiece, you don&apos;t have to deal with jaw fatigue. The high-tech, 1-window system allows 180° panoramic visibility. The AirGo Full Face snorkel mask is full of user-friendly features that are easy to use and help solve common snorkeling challenges. Easy breathing comes from their unique, dual chamber AirGo® System that separates inhaled fresh air from exhaled CO2. As you inhale, fresh air is pulled from the right chamber of the snorkel and as you exhale, it is directed through the left chamber using their patent pending exhaust technology. This ensures that you don&apos;t rebreathe your own exhaled, CO2 and are only breathing the fresh air around you. Measurements Small: <4" from chin to top of nose, Medium: 4"-5", Large: >5"